Congratulations to my baby brother and my new baby sister who were married yesterday! It was an amazing day (albeit H-O-T!) with wonderful friends and family. I love my new sister and my brother is one lucky guy. I actually took quite a bit of photos because Lord knows I couldn't just stand there and let a wedding go by! I'll have some of them up in the next week. Until then here's a crappy one from my phone. 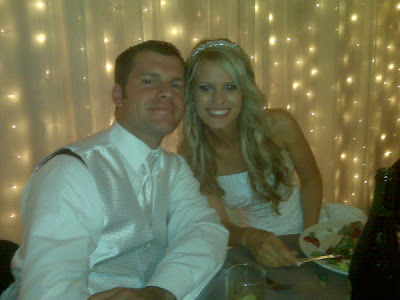 Congratulations Mr. & Mrs. S. I love you both!!! My friend Michelle is a PUNK. A PUNK I tell you. After reading about my FIRST SIGHTING she sent me this! 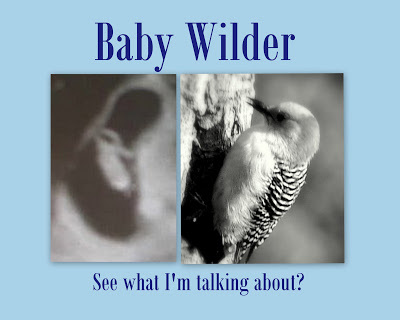 JUST TO CLARIFY I am not birthing a woodpecker. Hopefully this explains it better. THANKS A LOT MICHELLE. Yesterday I had my first prenatal appointment. And it's a official. I'm pregnant. Just in case you were worried about it. I'm 7 weeks and 1 day. 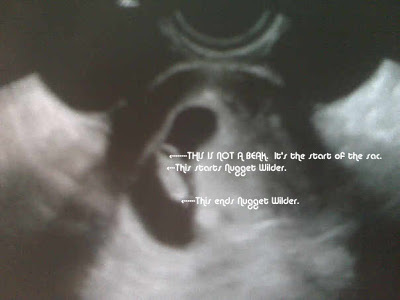 Nugget Wilder is due to join the world approximately around February 9, 2010. Lordy that seems forever away. I was pretty nervous going in. Hubby and Momma both went with me. It was nice to have both there. Hubby because well, he's partially to blame for my current state and Momma because she's lived through this three times already. My doctor was ok. Not awesome. It kind of felt like when I was engaged and planning my wedding. She has obviously delivered 1000 babies and been around 1000 of pregnant ladies but this is MY FIRST. And probably my ONLY. So please don't treat it as ordinary. Because it is in no way ordinary for me. But we have really good insurance and we don't pay too much for it, so I'm not going to complain too much. I am going to look into seeing a midwife though. So we will see if that goes better. The coolest moment of course came when they did my ultrasound (INTERNAL thankyouverymuch. HELLO DOCTOR.). I was just laying there and suddenly there was the Nugget Wilder. Right there. We could see it's little body. I teared up and so did Hubby. Momma took pictures. Wow. It's really in there. So now we have baby's first picture. Freaking amazing. Okay, so after much thought ya'll are gonna hear it all. That's right. IT ALL. I figure it's my blog which is supposed to be about my life and this will be consuming my life for the 7 and half months SO why wouldn't I write about it. Plus I have single friends and/or non-pregnant friends that I have insisted I give them all the gory details. So in order to spare those of you who just don't want to hear it we are going to have a Pregnancy 101 series. I'm going to write about all the beautiful and not-so-wondrous things going on in my body. And now, you have been warned. H-E-double hockey sticks. That is how I felt about 3 hours ago. It was bad friends. I woke up this morning knowing it wasn't going to be a good day when I wanted to puke while eating breakfast. Awesome. I did gulp down some milk though which seemed to help my stomach. And by the time I did get to work I look liked death warmed over which brought some attention from the coworkers. So some of them know now. I'm officially being poisoned by my hormones. The past two weeks it has hit me a few times but NEVER like this. HOLY COW. I sat down to eat some lunch hoping that would make me feel better and I was concentrating so hard on eating and not being sick that when my boss poked his head over my cubicle I yelled and jumped about 5 feet. That didn't help. So I grabbed my stuff and headed to my car praying the whole way that I wouldn't get sick in the parking lot. I shoved a ginger candy in my mouth, pulled around the corner in the shade, blasted by AC and put on my Taylor Swift to calm my mind. And then I slept for an hour and woke up feeling like a new person that had just slept for 12 hours. Much better. Here's all my tricks that I tried today that failed me: eating, eating more, eating protein, eating crackers, eating every 30 seconds, drinking 7-Up, drinking water, not drinking water. Here's the only thing that worked today: ginger candy and a nice hard nap. Followed by some salt and vinegar chips once I got back to my desk. So I ask you, what tricks help you get through this time? I had a fabulous Father's Day post written in my head. And then it was Father's Day and I was beyond tired and had to cook a big meal for hubby and his daughter who was bringing over her bf to meet us for the first time and I also had to clean house and make some cookies and before I knew it the day was almost over and I was falling asleep in my chair. Crap. Happy Father's Day peeps. Here we are a whole week later and I haven't written a single thing. And I would apologize but quite frankly people, I'm beat. This growing a kid inside of your body is quite exhausting. Also, it makes you very hungry. -Extreme and utter exhaustion. I mean I have put myself to bed at 9 p.m. And for those of you that know me that is SO not normal. -EMOTIONAL. Hello roller coaster. One day I was SO tired I was crying about it. Luckily I gave hubby a heads up before I totally broke down. -All food is like Chinese food. I can stuff myself and a mere hour later I'm thinking, "Hmmm. I could really go for a banana." -Fruit is the nectar of the gods. I am not a huge fruit eater normally but it tastes so sweet to me right now. -"Morning" sickness doesn't always happen in the morning. I find that if I do feel sick it is usually first thing in the morning and right before dinner. Thus the constant eating in hopes it stays away. -HELLO DREAMER. Can we talk about the CRAZY and vivid dreams of a pregnant person? HOLY COW. And I am dreaming about things that I have never in my life dreamt about before! -Worry. I WANT this baby. I want to be a good mother. I want a healthy kid. I want hubby to not get lost in the shuffle. I want the perfect job. I don't want to screw up. Next week I go to meet my doctor and have my first ultra-sound. And yes, I know it is the internal ultra-sound (EWWWWWWWWW). I've been going back and forth about how much to write about this pregnancy thing. On one hand I think it should be a lot like writing about marriage. I don't think you should only write how great marriage is. It's unrealistic and I think it gives single people the wrong idea. I don't think you should air all your dirty laundry but you should certainly be honest. So I feel that way about pregnancy. It is a wonderful and beautiful thing. And amazing for sure. But it has some not so fun side-effects as well. As a first time pregnant women I would rather go into it with my eyes wide open than be surprised. But maybe that's just me. My pal NJ is engaged and getting married in August (DUDE! That's only 2 months away!!!). 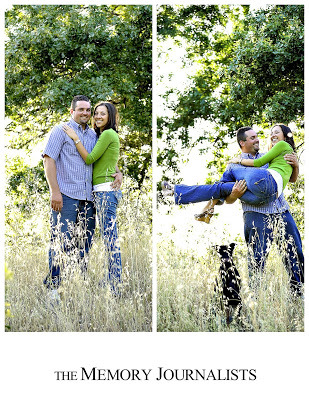 We had a Memory Journalists meeting a few weeks ago (the day I found out I was PREGNANT) and as part of our meeting we took their engagement pictures. How cute are they? 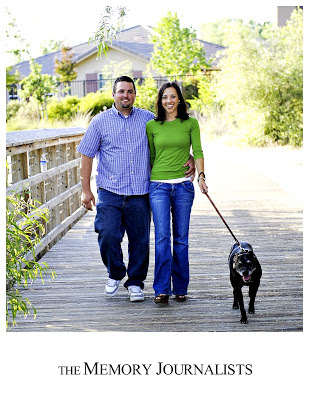 Congratulations NJ & John (and Kylie too!)! I'm so happy for you guys! Okay for those of you who have had kids or are currently pregnant you know this blog is going to become CONSUMED by all things pregnant and baby. I can't help it! I'm sorry! Wait, no I'm not. This is my first. My first pregnancy, my first baby, my first little poppyseed floating around in there. And if my hubby has anything to do with it my only. So I'm going to soak this up and enjoy every minute. And please save your horror stories for when I ask for them. Thanks. I am so amazed by my body right now. Truly. I signed up for one of those weekly emails that tells you about what is happening in this week and what all that good stuff. Right now my little punkin is the size of a poppyseed and is moving it's way into the placenta. ALREADY it is forming it's internal organs. CRAZY. I can feel my body moving, changing, contracting to prepare itself to grow this little love. That's the other thing, the INTENSITY I already feel. I find myself throughout the day touching my belly or rubbing it. I know that when I see my baby the love will be like no other but the love I already feel is like no other. I promise to try to not ONLY blog about babies and pregnancy. Promise to TRY. But all I can think about right now is my little poppyseed.